BOSTON - Friday, August 24, 2018 - City officials today joined community members and partners to celebrate the opening of Tontine Crescent plaza, a new streetscape intervention on Franklin Street in Downtown Boston that includes a large pedestrian plaza with plantings and seating; a protected bicycle lane; and a motor vehicle lane that responds to the character and needs of the street. The new tactical plaza reimagines an 18th century Charles Bulfinch designed urban park that had been converted over time to roadway space to accommodate automobiles. This initiative is one of several the City is undertaking to improve the public realm in different neighborhoods throughout the city. 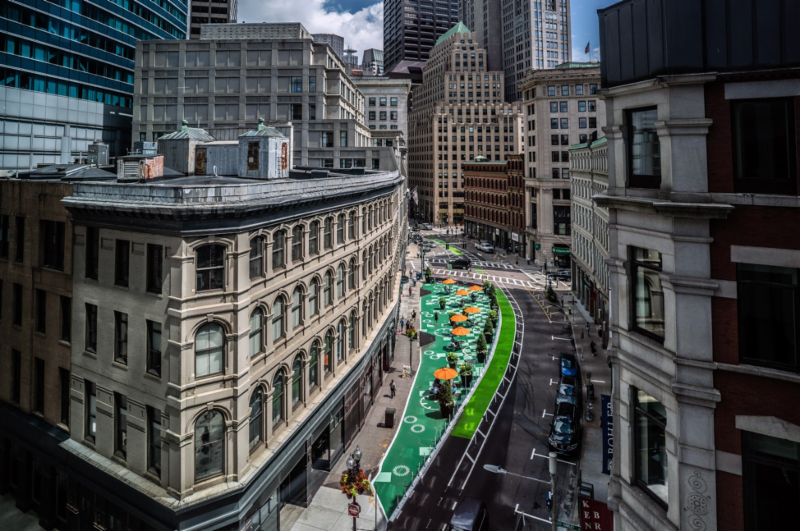 "I am excited to activate this space in downtown Boston and show the possibilities for redesigning streetscapes for the benefit of all modes of travel," said Mayor Walsh. "Reclaiming the Tontine Crescent plaza and turning it into an area where people can travel safely, and enjoy the city surrounding them is what we strive to accomplish in our Go Boston 2030 mobility plan, and I am thrilled that it is now available for everyone to use." In partnership with the community, the Boston Transportation Department (BTD) redesigned the underutilized roadway between Arch and Hawley Streets to better serve all users of Franklin Street. The project highlights how to reclaim surplus roadway space for more people-friendly purposes. Improving the public realm was identified as a top priority of Boston residents and others who participated in the public engagement process for Go Boston 2030, the City's transportation plan. "Our streets and sidewalks are not just our paths to and from school or work, they are also our front stoops and our neighborhood gathering spaces," said Chief of Streets Chris Osgood. "These projects highlight how our streets can celebrate our neighborhoods and bring our City together, and the projects we are celebrating today are just the beginning." "The implementation of tactical public realm improvements is well underway in Boston," said Boston Transportation Commissioner Gina N. Fiandaca. "In addition to the Tontine Crescent project, street murals have been painted in Allston, a parklet has been created on Newbury Street, and designs are underway for the installation of a tactical plaza in Chinatown, as well as for murals and a parklet in Egleston Square on the Roxbury/Jamaica Plain line. We look forward to working with residents and others to bring additional public realm improvements to neighborhoods throughout the City." The Downtown Boston Business Improvement District (BID) worked with the BTD on the implementation of the Tontine Crescent plaza, assisting with community outreach and maintenance. After a year of outreach, the designers used easy-to-install measures such as flex posts and paint to reshape the space. The plaza will be in its temporary form for a few years to evaluate its use and impacts. Millenium Partners Boston funded its design and installation. "The Tontine Crescent plaza is a creative, practical and innovative addition to Downtown Boston's public realm," said BID President & CEO Rosemarie Sansone. "This new public space reflects a collaborative effort through a yearlong planning process that engaged property owners, area businesses, and was facilitated by MP Boston, the Boston Transportation Department and the Downtown Boston BID. The feedback has been extremely positive, and we look forward to overseeing the daily operation of this vibrant community amenity." "As a physical therapist on Franklin Street for 29 years, I have always promoted the wonderful benefits of exercise," said Jake Kennedy of Kennedy Brothers Physical Therapy. "Now, to see this historic street open itself up to bikers and walkers makes me so happy. Every time we make a section of the city healthier, Boston wins." The Phillips Square tactical plaza is a reclaiming of an overly-wide street in Chinatown, that will create a new iconic entrance to the neighborhood when it is installed later this year. The design converts a section of Harrison Avenue between Essex and Beach Streets into a temporary plaza using paint, plants, and benches adjacent to parking and lanes for bicycles and cars. It is supported by partnerships with Chinatown Main Streets and Cresset Harrison LLC. Two parking spaces have been converted into outdoor "parklet" seating on Newbury Street in tandem with its Open Streets events, and a similar parklet is being designed for Egleston Square near the Washington Street - Boylston Street intersection in partnership with the Egleston Square Main Street local-merchant group. East Boston will see an outdoor cafe at the triangle plaza along Meridian Street at London Street sponsored by the Meridian Food Market, and Sammy Carlo's Delicatessen will maintain the public outdoor cafe at Bennington and Moore Streets. Building on the success of newly installed street murals in Allston and Roslindale Square, a new mural designed in collaboration with residents will be installed in Egleston Square as well. A Better City's Wicked Streets placemaking program supports the parklet in Egleston Square and outdoor cafes in East Boston. Go Boston 2030 is the City of Boston's long term mobility plan. It envisions a city in a region where all residents have better and more equitable travel choices, where efficient transportation networks foster economic opportunity, and where steps have been taken to prepare for climate change. Whether raveling by transit, on foot, on a bike or by car, people will be able to access all parts of Boston safely and reliably. A list of projects and policies have been developed that are being implemented as early action projects in the near term, and a set of long term projects and policies are intended to be implemented over the next 15 years.